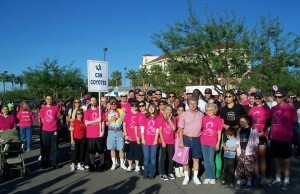 In early October, about 130 CSN employees signed up for the annual Making Strides Against Breast Cancer Walk at the Las Vegas Marriott, part of the American Cancer Society’s national fundraising effort to cure breast cancer. 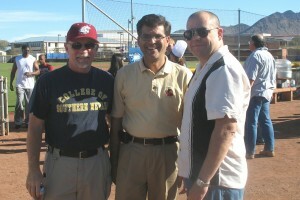 The CSN group raised over $9,500, the largest amount raised that day by any group in southern Nevada. What a tribute that event was to our faculty and staff! Members of the CSN Making Strides Against Breast Cancer Team before the walk. CSN raised the most money of any team at the event. Last Saturday, CSN celebrated our “Fall Get-Together” for faculty and staff and their families at the Henderson campus. What a great afternoon we had together! We experienced unprecedented attendance, and it was wonderful to see everyone out with their families, enjoying the moderate weather. I want to thank Joan McGee and Judy Stewart for organizing the event, Mark Rauls and Terry Pippen who volunteered to fill water balloons, Tim Chambers for hosting us and the many volunteers who helped with the food. The vice presidents and I manned the grill and produced enough veggie burgers, hot dogs and hamburgers to feed a small army. I got a chance to meet many of your families, and, of course, I understand the many pleas to ask Chef Metcalf to help at the grill next year. Come mid-semester we can get so consumed with our day-to-day schedules, our classes and meetings. These kinds of social events are important for a college our size, and I hope to see you at the fall get-together next year. Thanks to all for coming out. These events are part of CSN life in a great organization of which we all can be justifiably proud. 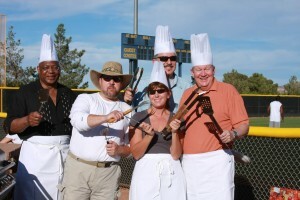 The chefs: Dr. Art Byrd, Darren Divine, left, Patty Charlton, Larry Mason and Mike Richards.